The Ajanta Caves are rock-cut cave monuments dating from the second century BCE, containing paintings and sculpture considered to be masterpieces of both "Buddhist religious art" and "universal pictorial art". 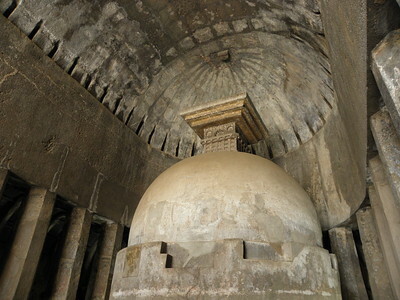 The complex of Ajanta consists of several viharas (monastic halls of residence) and chaitya-grihas (stupa monument halls) cut into the mountain scarp in two phases. My vote in the Ellora-Ajanta "dispute" clearly goes out to Ajanta! Although the size of Ellora obviously shows more rockcarving craftsmanship, I fell for Ajanta's lovely location at a cliff overlooking a horseshoe-shaped bend in the river. And for the quality of its paintings of course. The colours in the paintings have survived the ages pretty good, although there is a yellowish glow over most of them. Local, natural dyes were used, and blue (lapis lazuli) was imported from Central Asia. Some of the caves, notably 1 and 2, have their walls and ceilings completely covered with these paintings, showing various Buddhist scenes including animals and people. Other favourite caves include numbers 10 and 26. They resemble the Music Hall at Ellora, with the formerly wooden ribs at the ceiling and the decorations all around a central stupa. Cave 26 also has a great carving of a reclining Buddha. I visited Ajanta on a tour from Aurangabad. They leave daily (except Mondays when the caves are closed) at 8.30. You can buy tickets from several organizers, but will all end up at the same bus. The drive out there is 2.5 hours (100km, at 40 km/h about an average speed in India). An English-speaking guide is included. As always on tours like this, the site visit is a bit rushed. But the tour was OK in general. It is also easy to get to the Ajanta Caves by public bus, they leave from platform 6 at the Aurangabad bus stand (buses to Ellora leave from platform 8). I visited this WHS in November 2016. Having already visited Badami Caves, Elephanta Caves and Ellora Caves, I thought Ajanta Caves were going to be somewhat of an overkill but I was so wrong. What Ajanta lacked in terms of architecture and carvings/sculptures it made up for with outstanding paintings. A flashlight is a must to be able to appreciate the beautiful paintings especially in Caves 1 and 2. 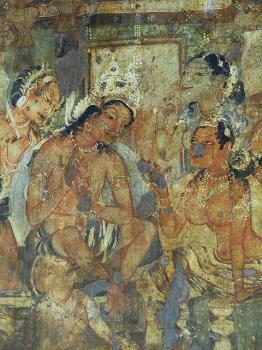 The most famous paintings are the Padmapani and the Vajrapani. In Ajanta, Caves 2 and 16 are worth viewing for the paintings and murals, Caves 4 and 24 for their sculptures and architecture, while Caves 1, 7, 9, 10, 17, 19 and 26 have a bit of both. Cave 26 is quite similar to one of the Buddhist caves in Ellora but the one in Ajanta also has some paintings and a lovely reclining Buddha. Cave 1 is the closest to the entrance/exit and the most beautiful of the Ajanta Caves. With this in mind I decided to head straight to the farthest cave and visit the caves in descending order ending with Cave 1. Just next to the ticket booth, you can spot the brass UNESCO WHS plaque. The tiny ASI bookshop was selling information booklets of several WHS (World Heritage Series) at 50% so for less than 15 euros I bought all the WHS booklets of the sites I visited and of others I wish to visit. I discovered my love on Buddhist rock craving when I visited Longmen and Yungang Grottoes in China and this love has been cemented when I visited Ajanta Caves. I did my best to spend my weekend break during my business trip in India to see this dream destination. From Mumbai I took an early morning flight to Aurangabad, after landing, a rental car with driver welcomed and directly took me to Ajanta. It was a comfortable ride with interesting view of Indian rural lifestyles and countless cotton and sugar cane fields. I arrived the historic town of Ajanta at 10 AM and had brunch at small restaurant on the way to Ajanta, a little bit surprised, the restaurant was full with Italian and Korean tourists who clearly divided the place into two zones. It was my guide plan to let me visit Ajanta before lunchtime as he claimed that the place will be quieter and less tourists, and his word seemed to be true as when I was at the parking gates, many tour buses were leaving for lunch. My guide also warned me about tourist scam and informed me all things I need to do to reach the caves. At first I had to buy bus ticket and took the bus from parking and souvenir shop areas to the cave zones. On the bus I met a group of very friendly Tibetan monks from Drammasala, they invited me to visit Dalai Lama if I had time next month. The bus stopped in the nice green garden area where I had to buy another ticket but this time for the caves. Then I climbed the stairs to see the caves which located on the hill next to ticket. The first view of Ajanta was stunning of beautiful horseshoe shape valley with many caves on the cliff. Ajanta was truly amazing and beautiful; each cave has its own charm. Some caves still able to preserve the ancient paintings, the colors of these paintings were unbelievable beautiful. Not only painting, the quality of rock cravings was also impressive with graceful depiction of Buddha and many small motifs. Caves 1, 4, 17, 19 and 26 turned out to be my favorite for their stunning details. I looked around Ajanta for almost 2.5 hours; the overall experience was great similar to the time I had at Longmen and Yungang, and returned to the car park in the same time that tourist buses backed to Ajanta again. For anyone interesting on my final verdict on Ajanta vs Ellora, I would prefer Ajanta more than Ellora. While artistic and architectural merits of these two sites seemed to be equally impressive, Ajanta was better in terms of location and site protection management than Ellora. Also the single theme of Buddhism in Ajanta made it easier to contemplate Indian artistic development than multi-religious theme in Ellora, at least from my personal perspective. The paintings and the sculptures are just fantastic. It is a pity that they have now become very fragile. May I suggest that the authorities commission artists to recreate a replica so that the casual tourist gets a feel and the caves can be reserved for serious students of art, architechture, archaeology etc. and for meditation. I had planned to visit the caves in 1978 but could finally do so only in 2011! It is awesome to imagine how it must have been in 6 CE! One needs to spend a week to view the paintings completely. These were a very late addition to my itinerary, but I could not have made a better decision as they were magnificent. They are in a pretty compact area, being in a horseshoe shaped bend in the river; this makes visiting them pretty simple. The carvings here are impressive however the main point of interest is the remnants of the colourful painted interiors of the caves. The fact that the caves were untouched for over a millennium has helped to preserve many of them. I was really struck by how impressive the paintings were. They are particularly vivid and cover a pretty large amount of the interiors of many caves. My guide was keen to display the echoing acoustics in one of the caves and it was a very impressive experience, I could imagine the effect being magnificent if there were several people chanting inside. I found the most impressive interior to be that of cave 26, with a nice carving of a reclining Buddha. I arrived early and had to wait for the caves to open. My friendly guide for the morning took me off on a short hike to the lookout point on the other side of the river which offered a great view over the caves and also of the nice set of waterfalls nearby. I would thoroughly recommend making this short detour. When we returned I found out that it was world heritage week, and as such all entry fees were waived. It also meant there was a delegation touring the caves which I caught up with at the opening of an exhibition about the WHS of India. This site always get compared to the reasonably nearby Ellora caves, they are very good companion sites. As Paul Tanner states below you will be hard pressed to find a better pair of sites anywhere in the world. I think that I preferred the visiting experience at Ajanta, the site was in a nicer setting and the crowds were a little lighter, it also had the added extra of the painted interiors. However I would say that nothing (at Ajanta or probably anywhere else) could quite compete with the magnificent Kailash temple at Ellora. I visited both Ajanta and Ellora in one day starting from Aurangabad, it was a long day helped by a 4:30am arrival from Mumbai. My early morning decision to jump in a taxi to take me to both sites was richly rewarded. An exceptional World Heritage Site in the very highest category and worth going well out of your way for. i m a buddhist monk,(age 26) my name is bhante n.vidyanand (thervada)i have search more buddhist caves which is unpublished.I have take these photographs for wish to show u.How i can please tell me.By some Hinduse whose r serving in MTDC Dpt. they r not beaving very calm and quite because Buddha teachings how to live calm and quite therefore i will suggest to u as a buddhist monk u should be add to a build a "meditation centre" at ajanta caves. For that i request to u we manage on ajanta caves boilos some land blank for meditation centre otherwise i will plan to take some land for meditation centre. i hope u all of them unit co-oprate to that Holly work to progress a pure mind. I heard about "Ajanta Caves" 300 thousand japan currency had been donated to develope "AJANTA CAVES" but i was seen there all that currency not utilised proper way. INDIA is not a rich country so i suggest to u that there should be so cheap cost to reach from t_ point to "Ajanta caves" ( 4 km) because before start bus that time lots of people was come to see Ajanta place. Now a days Bus fare is so thats why lots of people not come to see Ajanta caves.AJANTA CAVES near area 0% pollution so should be there CNG gas Bus sholu be start to save and preserve and reserve from the pollusion it is ur responcibility. Be include and think about it. Ajanta is a superb site that is well worth visiting (and putting up with the ASI's rip off entry fees). It is stunningly set and in magnificent condition. One can only marvel at the fabulous artwork. It is perhaps slightly surprising to find that Ajanta hasn’t yet been reviewed although coverage of India’s WHS on this site is pretty high. It is well worth a visit and combines well, in a journey from Northern India to Mumbai, with the relatively nearby and complementary WHS at Ellora. We got off a night train from the north at Jalgaon, took a bus (frequent) to Ajanta, spent several hours there (enough), bussed on to Aurangabad to overnight and then visited Ellora the next day - as fine a “pair” of WHS as you will find anywhere! Indeed you could have seen the WHS at Sanchi the previous day and that at Elephanta on the 4th –though that might be a bit greedy (and I think Aurangabad/Ellora justifies more time)! I say “complementary” since both are religious shrines consisting of caves containing primarily Buddhist (but also moving on to Jain and Hindu at Ellora) relics. 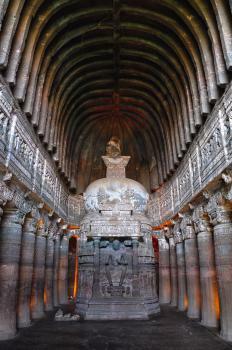 Ajanta is primarily famous for its paintings (but has sculptures also) whilst Ellora is all about carving. Ajanta predates Ellora so that is the best sequence to see them in – indeed it is thought that the later builders/artists at Ajanta moved on to Ellora in the 7th century. I must admit to finding Ellora more impressive (see review) – yet Ajanta was more remote and better survived later depredations, being “rediscovered” by some British tiger hunters in 1819. The siting is rather fine (Photo) and if it is not too crowded you can imagine both the monks going about their daily lives and the British stumbling upon the caves from the top of the cliff. If you have read my reviews of 4 Chinese Buddhist cave WHS you will know that Buddhist paintings/sculptures do not excite me that much, but the vivacity of the scenes and the colours is undoubtedly very fine and the more worldly subject matter of legends appeals to me more than 1000s of Buddhas/Boddishatvatas (though there are plenty of these too!). It is well worthwhile having a good guide/book. The Ajanta Caves, situated 105 km north of Aurangabad, dates back to 200 AD to 650 BC, predating both the Ellora and Elephanta Caves. The Ajanta Caves was, similar to the Khajuraho Monuments, discovered accidentally by a company of British soldiers in the early 19th century. Hidden under thick vegetation they had been forgotten for over 1200 years. But the isolation, and the fact that the caves seem to have been abandoned over a short period of time, are likely the major contributors the fact that we can enjoy this remarkable piece of art today as they once were made and used by the monks. The 30 caves, placed in a horseshoe shape around a ravine where the river Wagura slowly flows along its bottom, are all carved out of the rock and are all dedicated to Buddha. Several human and animal figures are carved out of the rock and there are many exotic paintings depicting the life and incarnations of Buddha. 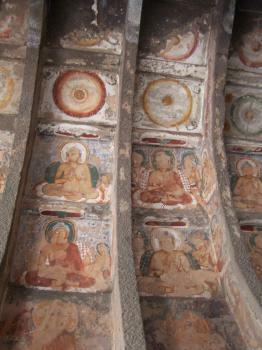 The murals on the cave walls are still in a good condition, maintaining its original freshness and color. 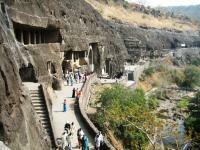 The Ajanta Caves can not be reached with public transport. But unless your on an organized tour or have your own guide its possible to charter yourself a Tuk-Tuk for a day and slowly travel the 40 km up north of Aurangabad. Stash up with loads of water though, it can be quite a hot trip!